The ALF Accademia Dining Collection by ALF Italia. The Table measures 82" closed, and expands to 103". 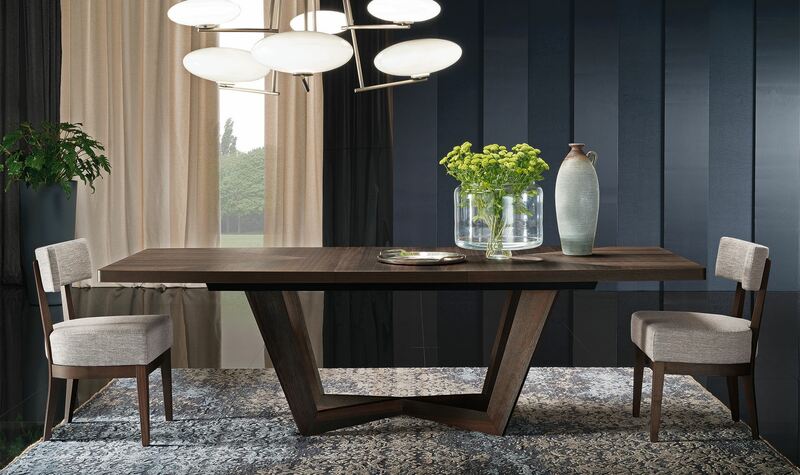 The ALF Accademia Dining Table offers a stylish, original, bold look. It comes in an elegant termocotto oak finish and features a stunning trestle base. It provides an extension leaf which will make this Table a great gathering piece. This piece is imported from Italy. 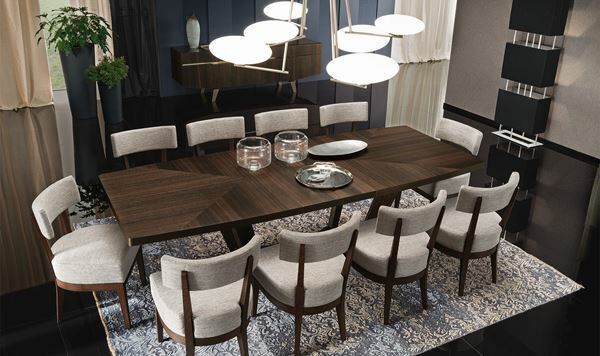 The Accademia Dining Room Collection by ALF Italia is a wonderful mid-century modern design, combining beautiful satin Termocotto Oak with soft antique gold metal footings, and soft brass accents. All the Accademia cabinets feature soft closing hinges, and are topped with a beveled sable toned glass top. The buffet, available in a condo size or a full size, features a unique and beautiful red leather interior, adding a unique visual contrast to the Termocotto Oak. The condo size buffet is configured with three doors, and a pull out cutlery drawer. The full size buffet is configured with four doors, and a pull out cutlery drawer. The dining table features a self storing leaf. We love the look of the low back side chair that is featured with this collection. But there is also a high back chair design. Both are extremely comfortable for enjoying dining with family and guests for extended periods of time. 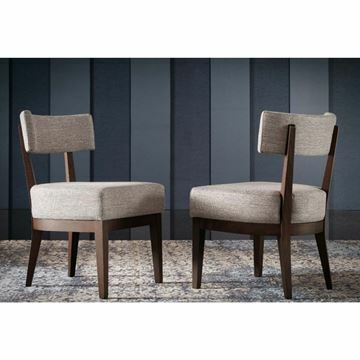 The cover for both chairs is a luxurious textured fabric blending a neutral color with a deep brown color, perfectly tied into the color of the Termocotto Oak finish. The capabilities of ALF to combine amazing design, materials, and quality of craftsmanship are perfectly shown in the Accademia Collection. Ensure your pieces look their best, for your enjoyment, for when the door bell rings—and after the guests have gone home! Because it is naturally abrasive, dust is probably wood furniture’s biggest enemy, as it leaves microscopic scratches that dull a finish over time. Guardsman Anytime Wood Cleaner can be used to clean and renew, leaving a rich, low-luster shine, but it’s also important to dust regularly—even when it’s not time to polish! Weekly dusting prevents the build-up of dust that can result in fine scratches when everyday objects come into contact with the surface. All smooth surfaces should be dusted regularly—furniture, cabinets, walls, floors, electronics, appliances, and even leather furniture. Guardsman’s Dusting Cloth is specially treated to pick up and hold onto dust without the need for dusting sprays. Soft and 100% cotton, it’s washable and reusable—and leaves no lint or dust-attracting residue! For best results when dusting, always wipe in the direction of the wood grain. Wood furniture isn’t just for admiring—it’s meant to be used for family and guests. But entertaining also means accidents—water rings from a glass, or heat marks from a hot dish or a pizza box—that can leave your furniture damaged or looking abused. AN OUNCE OF PREVENTION IS WORTH A POUND OF CURE. ALWAYS USE COASTERS, PLACEMATS, AND TRIVETS. But, if the unexpected happens, you can try to use Guardsman’s Water Ring Remover With a bit of luck, it may eliminate minor blemishes from many wood surfaces including white rings, and other marks and stains caused by water, heat, alcohol, cosmetics, and paint. If there is significant surface damage, you may want to consider having a Guardsman Technician fix it. Sometimes it's better to go this route than making a bad accident worse by trying to fix it yourself. To set up a Guardsman visit to your home, fill out this ONLINE REPAIR QUOTE and Guardsman will contact you shortly there after to go over a solution. Scratches, Chips, and Damage—To avoid scratches, never slide anything (vases, plates, serving dishes, etc.) across a wood surface. Light surface nicks and scratches can be treated with some Guardsman Wood Products That being said, please contact us if you have a scratch and are wondering what to do, or before attempting any significant repair yourself it's highly recommended to have Guardsman give you a repair quote first. It's more often than not that it's best to have a professional fix a problem. Attempting to do it yourself first may make things a bit more complicated and costly in the event that a professional needs to come in later to take care of things. It is a good idea to send an email directly to a repair technician to see what their input is before you start anything. You can Click Here to send a message to one and they'll get back to you shortly. Liquids—Wipe up spills immediately, and check to be sure liquid hasn’t seeped under any objects, such as a vase, where it can “pool” and dry, causing damage to the finish. Use linen or cotton tablecloths & placemats—Vinyl and plastic materials can damage some wood finishes or leave residues behind that build up on the surface of your furniture. Over time, these materials can make surfaces sticky and cause discoloration. Centerpieces—Use cork or felt pads under decorative objects, and swap them out several times a year. Sunlight - Sunlight can and will lighten and alter the color of most any finish. It is recommended to do your best at avoiding regular and prolonged exposure of any surface to sunlight. When not at home, keep blinds closed to keep the sunlight off of surfaces. Dining table leaf extensions should be kept in same amount of light consistacy as the rest of the table to avoid alterned effects of sunlight. If you have any questions about furniture care or repair, you can contact us and we'll be glad to assist in advise. The ALF Tivoli Dining Collection by Alf Italia. This soft contemporary design is crafted of beautiful light gray oak eco veneer. It has a warm satin finish. Chrome reveals and feet accent the collection. Soft closing door and drawer glides complete the attention to quality and detail by which ALF is so well known for. The ALF Teodora Dining Collection by Alf Italia. This elegant and soft contemporary design is crafted of beautiful light elm and features emperador accents. It has a protective high gloss finish which helps magnify the wood grain, bringing out a wonderful vibrancy to the elm wood. Soft closing door and drawer glides throughout the collection complete the attention to quality and detail by which ALF is so well known for. 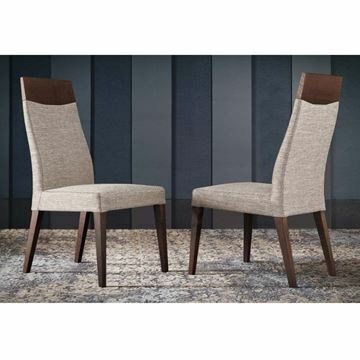 The seats of the dining chairs are covered in a rich taupe colored leather. The ALF Accademia Bedroom Collection, by ALF Italia. The Accademia bedroom collection is crafted in a beautiful and warm Termocotto Oak finish. The beautiful headboard is composed of perforated microsude inlays set within the beautiful Termocotto Oak. Available in King or Queen Bed sizes, it is fitted with LED lights and golden accents. Made in Italy. Made in Italy. Measures 51"W x 22"D x 67"H. A beautiful enhancement to any room you want to entertain in. The Accademia Occasional Table Collection by ALF Italia is a wonderful mid-century modern design, combining beautiful satin Termocotto Oak with soft antique gold metal footings. The nesting tables in the Accademia Collection are designed to either store as a single or pair underneath the rectangular coffee table. They also show wonderfully as a pair of free standing bunching tables. The capabilities of ALF to combine amazing design, materials, and quality of craftsmanship are perfectly shown in the Accademia Collection. Made in Italy. 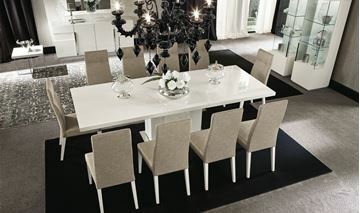 The ALF Canova Dining Room Collection by ALF Italia. The stunning ALF Canova Dining Table is sure to be the talk of everyone who enters your dining room. This beautiful table comes in a high gloss white finish with marble finish accents. The pedestal leg stands on a stylish chrome base. It features a pedestal base and a 20 inch extension leaf making it the perfect gathering table for family and friends. Pair with the matching dining chairs and cabinets to create a beautiful set. Made in Italy. 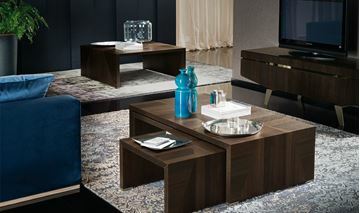 The ALF Accademia Tv Stand from ALF Italia. The ALF Accademia Entertainment Furniture Collection will provide a great place to set your television set and store all your electronics and accessories. It comes in rich termocotto oak veneers. It features one drop-front door and two storage drawers. It is adorned with golden-effect metal and mirror accents and stands on tapered legs. Measures 73"W x 21"D x 23"H.
The ALF Accademia Buffet from Alf Italia. Check out the interior of this cabinet!! The Accademia Buffet is an elegant, contemporary piece that will enhance the beauty of your dining room while providing ample convenient storage. It features four storage doors with shelves behind and one cutlery drawer. 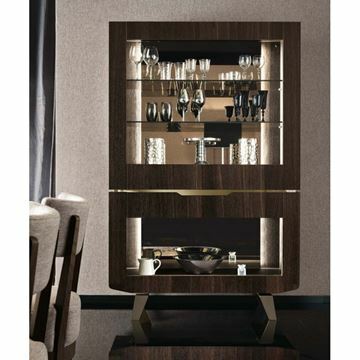 This beautiful Buffet is adorned with golden effect metal and glass accents, contrasting internal color and termocotto oak finish. It has a lacquered and contoured glass top. It stands on stylish tapered feet. A smaller 73" buffet is also available. Please contact us for details and ordering information. This piece is imported from Italy. 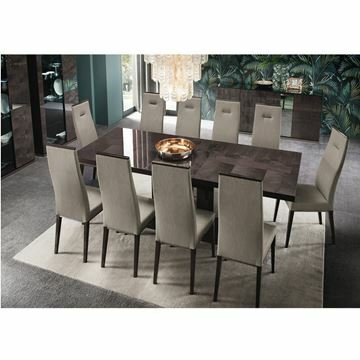 The Mont Noir Dining Collection by ALF Italia. A beautiful collection crafted in high gloss black lacquer. All of the cabinets are adorned with very unique rose gold hardware. The dining table is extendable, and features a self storing leaf. The leather side chairs also feature black lacquer legs and are crowned with a slim black lacquer accent. All pieces are 100% made in Italy. 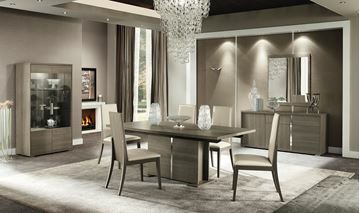 The ALF Heritage Dining Room Collection by ALF Italia. This symmetrical and elegant design is crafted in beautiful dark velvet birch, and top coated with a protective high gloss finish. The accents and reveals are black nickel. Two sizes of buffets, and two sizes of dining tables, make this collection highly configurable for your home's layout. And the tables feature a self storing leaf extension. 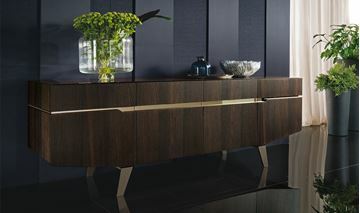 The buffets feature a unique anthracite toned glass top. The leaf extensions for the dining tables store within the table. 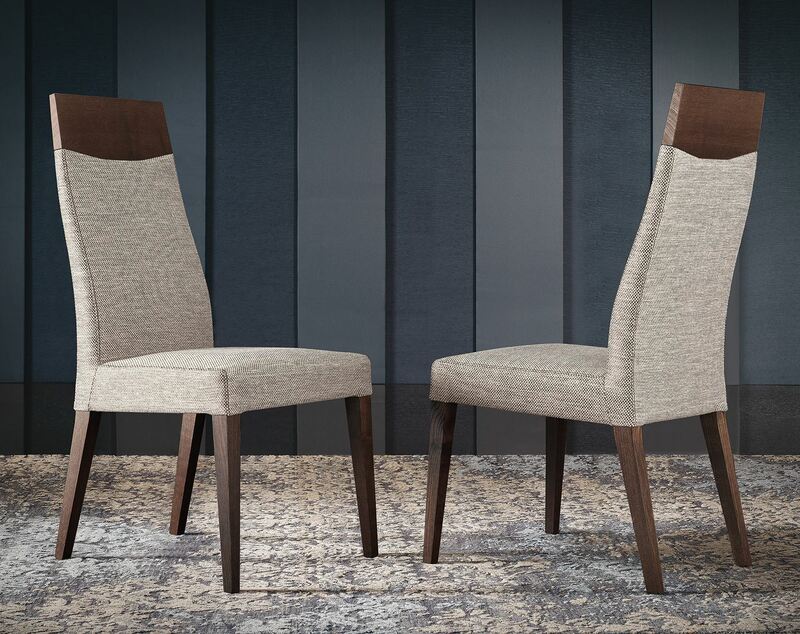 The dining chairs feature a stylish top crown crafted in matching dark velvet birch, and also have a single high back black nickel inset tuft. The Heritage Dining Collection is a wonderful fusion of Italian design and practicality. Soft closing door hinges complete the attention to quality and detail by which ALF is so well known for. The ALF Accademia King or Queenn Bed, part of the Accademia Bedroom Collection, by ALF Italia. 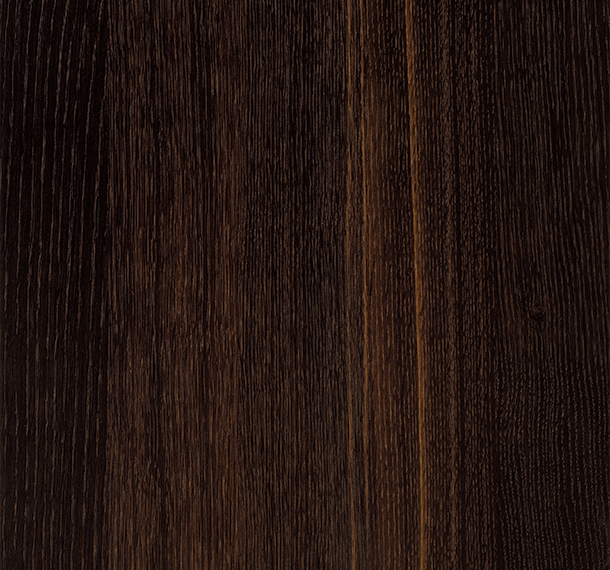 The Accademia bedroom collection is crafted in a beautiful and warm Termocotto Oak finish. The beautiful headboard is composed of a stylish perforated microsuede inlay set within the beautiful Termocotto Oak. Available in King or Queen Bed sizes, it is fitted with LED lights and golden accents. Made in Italy. ALF Accademia Dresser by ALF Italia. Elegance and contemporary style come together to create this Accademia Dresser from Alf Italia. This beautiful storage piece offers six large drawers making it a modern solution for the way you live. It features stylish brass reveals and golden-effect metal legs. The beveled glass top adds practicality and style to this beautiful mid-century modern design. Crafted in Termocotto Oak. This piece is imported from Italy. The ALF Accademia Chest by ALF Italia. 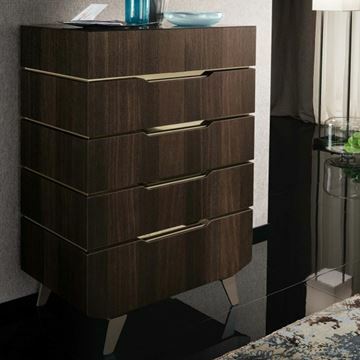 The ALF Accademia Chest of drawers will bring an elegant, contemporary style to your bedroom. 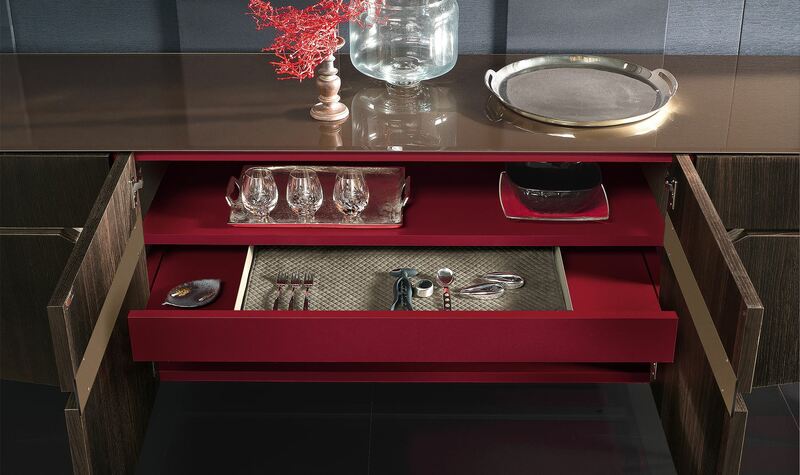 This beautiful piece features five storage drawers helping you keep everything tidy. It is adorned with brass reveals and golden-effect metal and glass accents, and stands on tapered legs. This piece is imported from Italy. 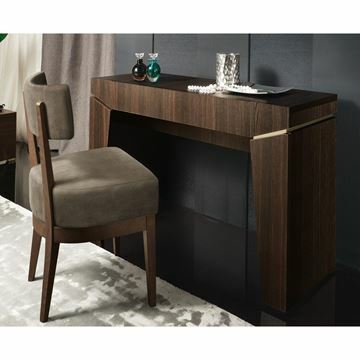 The ALF Accademia Vanity from Alf Italia. 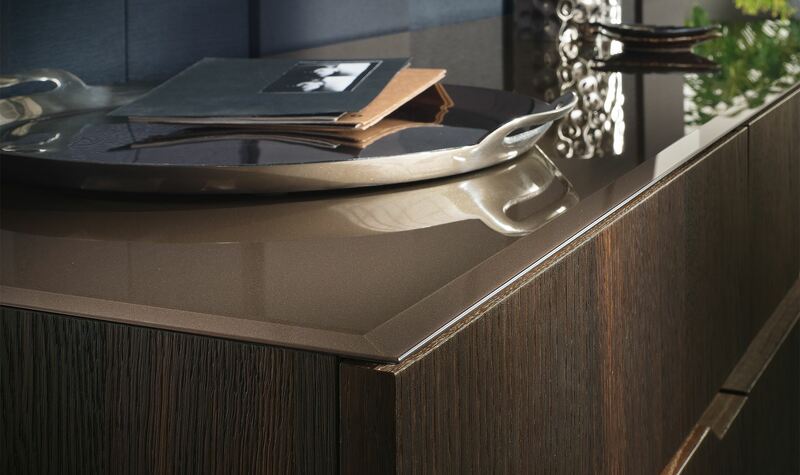 The ALF Accademia Vanity offers style and function. It features a lift top with upholstery lined storage, lights and a mirror. It also provides added storage with its side compartments. This piece is imported from Italy. The ALF Accademia Dining Chair by ALF Italia. This clean mid-century modern design offers an elegant, contemporary look. It features a Termocotto Oak base, tapered legs. The seat and back are upholstered in a rich textured fabric that is a blend of warm beige and espresso tones. This piece is imported from Italy. The ALF Accademia Regale Dining Chair by ALF Italia. This clean ergonomically mid-century modern design offers an elegant, contemporary look. The top of this design is crowned with a curved Termocotto Oak panel. It also features a Termocotto Oak base, tapered legs. The seat and back are upholstered in a rich textured fabric that is a blend of warm beige and espresso tones. This piece is imported from Italy.